Our most reliable position on offense, thanks to running back coach Ron Gould. Without the production from these guys, our offense would have gotten rocked even more than we already did last season. Now, Shane Vereen has left for the NFL (drafted by the New England Patriots), and Tedford has named Isi Sofele as our next starting running back. Isi will have to fill in some big shoes as he will be carrying a huge load next season. He may only be 5’7″ and around 190 pounds, but he has shown that he has great acceleration and footwork. The only problem he may have next season is taking lots of hits and trying to run past tackles like both Shane and Jahvid did the past few seasons. However, I still think Isi will become our next 1,000 yard rusher and someone we can count on. The backup to Isi still remains a mystery as there will be a number of contenders for this spot, which include Covaughn-DeBoskie Johnson, Dasarte Yarnway, Mike Manuel, and incoming freshman Brendon Bigelow. The backup running back is a very crucial position in our offense because our backups tend to get a lot of touches and in some games are given the ball more times than the starter. Isi can’t take as many hits as Vereen could, so our backup running back will most likely get more chances to carry the ball then our backups in the past have. Covaughn has the most playing time at of all the backups, but currently does not have the athleticism to prove that he can be our backup running back. Dasarte Yarnway, who just came back from injury, has an amazing physical build, but hasn’t had enough reps during practice, due to injury, to prove himself to the coaches and he has a tendency to hold the ball loosely. Mike Manuel had a great spring practice because of his ability to find the hole and hit it with good acceleration, and he is my dark horse to win the backup spot. There has been a lot of talk about incoming freshman Brendon Bigelow even though he has yet to take single rep in a Cal practice jersey. Bigelow does show great ability in his highlight film but tends to get injured. Whoever, our next backup will be, Coach Ron Gould will make sure that he will produce come Game Day. At the fullback position, we have two reliable players in Eric Stevens and Will Kapp. Currently, Tyndall is the backup to Stevens, but I think Kapp will take back that role after August. Eric Stevens will most likely start our first game just because he took much more reps during spring compared to Kapp who was out due to injury. Both players have had relatives play at Cal and in the NFL, Eric Stevens is the younger brother to Tennessee Titans and former Cal tightend Craig Stevens while Will Kapp is son of the famous Joe Kapp, former QB and head coach at Cal and also QB for the Minnesota Vikings. Even if these guys go down, John Tyndall has shown that he can be a reliable fullback. We have so much potential in position, but there were too many missed opportunities last season. 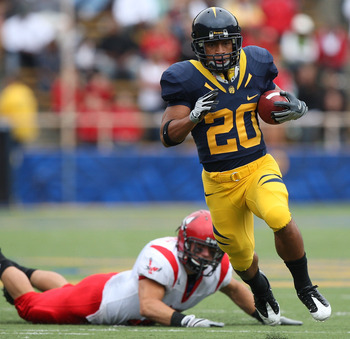 Marvin Jones will be back for his final season at Cal across from Keenan Allen. At their best, these two players are amazing, but they were just never as good as we hoped for. We saw a lot of potential from Keenan Allen in the first couple games of last season, but they weren’t real competition. Maybe it was because we didn’t have a good quarterback or maybe it was because former wide receiver coach Kevin Daft wasn’t that good, but there is no excuses for Jones and Allen this upcoming season. As long as these two can stay healthy, they have the potential of catching 20 touchdowns combined next season. Both Jones and Allen have told reporters that they have all their trust in Maynard and that they believe that Maynard can get them the ball. Let’s hope that this is true because we haven’t seen a great and reliable core of wide receivers since DeSean Jackson, Lavelle Hawkins, and Robert Jordan. The backups to both Jones and Allen are currently Michael Calvin and Coleman Edmond. Calvin proved his athletic ability this past spring and I believe he will continue to be the third wide receiver for Cal going into this fall. However, we didn’t see much from Coleman Edmond during spring because of his injury. I think after summer camp, Kaelin Clay will step up to be the fourth wide receiver because he has really good awareness and great speed (supposedly the fastest player on the team), but he is 4 to 5 inches shorter than Calvin and Edmond. I expect to see a lot of production out of this group this coming season, and I expect Keenan Allen to get a lot of looks from his half-brother, Zach Maynard. Anthony Miller will be back this season to start at tight end. *On a side note* I drank with Miller’s parents at a USC tailgate one time, I don’t remember much because I was so drunk but I think they were really nice haha. Anyways, I really think we didn’t use the tight end to the fullest last season. Early on in the season, Miller and Ladner had trouble blocking rushers and protecting the QB. However, they have shown to have good hands and can make plays. Coach Jeff Genyk, who in my opinion is much more energetic and exciting, comes back for his second season with this group and hopefully he can shape these group up so that they can provide protection and also an extra option for Maynard come September. We like to use two tight ends at a time a lot during the game, so both Miller and Ladner will see a lot of time. Behind them are Jarret Sparks, Spencer Hagan, and Jacob Wark. Ladner tends to get easily injured, so expect Sparks, Hagan, and Wark fight for that spot behind Miller. Spencer Hagan is a wide receiver turned tight end who turned heads this past spring practice with great catches, but his build is not big enough to withstand pass rushers in the Pac-12. Unfortunately, we didn’t see much of Jarret Sparks during spring practice so we don’t know if he will be up to the standards of what we expect from our tight ends. There is a lot of potential in Jacob Wark, and if he stays healthy next season he might end up becoming the backup tight end behind Miller at season’s end. In my opinion, the offensive line is the most important role in football. Without them there is no passing or rushing whatsoever, and that is probably why our offensive could not do anything last season. Our pockets were collapsing in less than three seconds, our quarterback was getting sacked way too many times, and our guys just couldn’t set up blocks for Shane Vereen. However, with our new (and former) offensive line coach Jim Michalczik back in action I think we will be much better than the last two seasons. At Left Tackle, we have our reliable Mitchell Schwartz going into his senior season. He will need to keep healthy throughout the entire season to maintain his leadership over this group. He does very well during run plays, but has struggled with pass rushers that come off that edge. He is currently on the 2011 Rotary Lombardi Award Watch list, is on the third-team preseason All-American of GoDaddy.com, and also on the Outland Trophy Watch List. Behind Mitchell Schwartz will most likely be Bill Tyndall who helped his case during spring ball when Schwartz was out due to injury. Brian Schwenke will start at Left Guard this coming season. Lets hope that with a couple seasons under his belt and also starting last season, he has a better understanding of his role and the schemes that we run. He can bench press like crazy in the gym, so lets hope that he can place that strength into his game. Currently, redshirt freshman Alex Crosthwaite is the backup at this position, who was ranked as the 11th-best guard prospect by Scout.com. The short but absolutely bulldozing ball of meat, Dominic Galas, will start at Center. He showed that he can take down any lineman last season but he tends to lack a sense of self-control of his energy and toughness that causes him to lose his awareness of the game. Lets hope that he can control his strengths this coming season. Mark Brazinski (who wears a polo and cargo shorts every single day at Berkeley) will back up Galas at center, even though he struggled a bit near the end of spring ball. Veteran Justin Cheadle will start at Right Guard again this season. He has shown some improvement but needs to increase his strength and agility against bull rushing attacks. He will be backed up by 339 pound Geoff Gibson. Gibson is huge and needs to lose a few pounds to increase his agility but still maintain his physical strength. Matt Summers-Gavin (MSG) will take on the position of Right Tackle. He had way too many injuries or concussions last season and he had a lot of trouble with pass rushers as a tackle. He was really dominant as a freshman at left guard (earning him All-Freshman Pac-10 honors); however, our lack of depth has forced us to place him at tackle. We will need Coach M to fix up MSG in time for next season. Tyler Rigsbee will play backup to MSG. Rigsbee received a lot of reps during spring and proved to the coaches that he can play. He just needs to be consistent and understand his position better.